Developed by internationally renowned cosmetic dentist and bleaching expert Dr. Rod Kurthy, the KoR Whitening Deep Bleaching System is used by thousands of dentists worldwide. It is considered to be the most reliable and effective bleaching system ever developed. How does the KoR Whitening Deep Bleaching System Work? Molds of your teeth will be made to fabricate your own unique, ultra comfortable KoR Whitening Deep Bleaching Trays. You and your dentist will select which level of KoR Whitening is the proper fit for you. You will wear your Deep Bleaching Trays at home for two weeks while you sleep. Depending on your selection, you may also have one to two simple whitening visits in the dental office. How long does KoR Whitening Last? 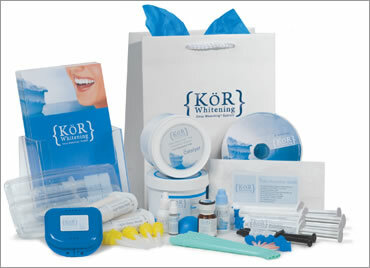 Unlike other whitening methods, with easy periodic home maintenance, KoR Whitening is entirely permanent. 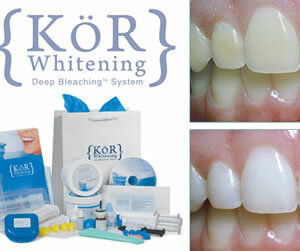 KoR Whitening whitens teeth dramatically, often lightening them 16 shades or more. Although everyone is different, with the proper KoR Whitening System, all teeth will have stunning results. It even whitens tetracycline-stained teeth! Will my teeth look too white or unnatural? No. Real teeth can’t look unnatural, they just look beautifully white. You’ll get the ideal shade that’s right for you.